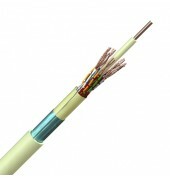 Normally used for the internal wiring of public buildings where there is high concern of safety of people and equipment. CW1600 has low smoke zero halogen insulation, aluminium foil screen and Limited Fire Hazard sheath. For cable with more than 6 pair, a fire barrier tape is included on CW1600. A ripcord is located directly under the jacket to make stripping the outer sheath easier. CW1600 is design to be terminated into 0.5mm IDC connection blocks. Solid copper conductor, coloured core identification of Low Smoke Zero Halogen insulation. Twisted into pairs, screened with an aluminium/polyester tape in contact with solid copper drain wire, fire barrier tape on cables with more than 6 pairs, Low Smoke Zero Halogen sheath. Other pair combinations or larger numbers of pairs and alternative conductor sizes are available on request.